1 Piece Stainless Steel Tailgate Molding Moulding Trim Accent 3 1/4"(3.25") Wide for 2002-2008 Dodge Ram 1500. Other Tailgate Trim Gallery. 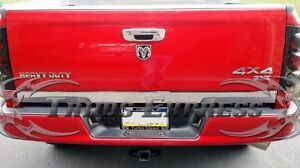 2003-2009 Dodge Ram 2500/3500. Premium quality stainless steel with polished surface. Package was left on the porch open area for any1 to take it not gd 4 bussines. Packaged great. Fit great, looks great. Thanks! Excellent!! Fast shipping!! Highly recommended!! !